¡Music and dance for every Body! Wake up people and dance! You do not have to follow certain steps: just take your shoes off and dance who you really are. Do you want to experience feelings of Joy, Love, Passion and pure Happiness – Feeling at home in our Humanity? Come and experience a true a connection with yourself, others and the world and your daily life will transform! Das Festival kostet 111 Franken plus Unterkunft und Verpflegung. mit biologischer Vollwert-Verpflegung in traumhafter Landschaft direkt am Bodensee. Many different lodging options available. 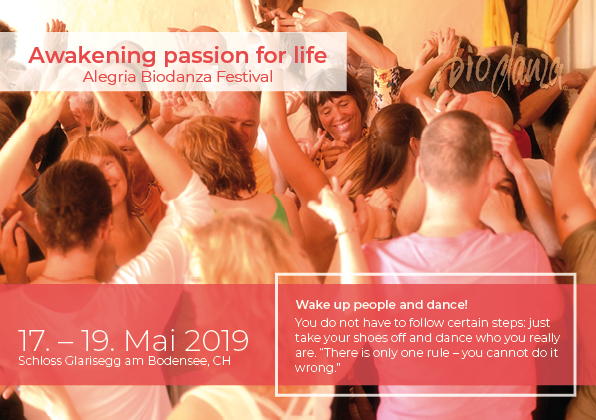 No previous Biodanza experience required. Wake up people and dance! You do not have to follow certain Steps: just take your Shoes off and dance to celebrate the fact that you are Alive! !